The NBA All-Star game is tonight and in honor of the annual showcase of the league’s top talent, I present to you my Cleveland Cavaliers All-Time All-Star Starting Five. The selections for this roster were made based off of every Cavaliers player in franchise history to be selected to the All-Star team. 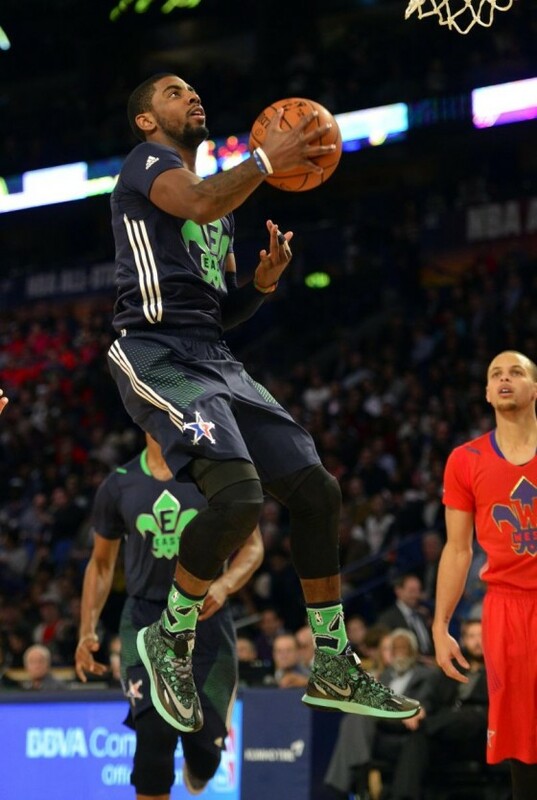 Kyrie Irving soars for a layup in the 2014 All-Star Game in New Orleans. Kyrie Irving’s first five NBA seasons have already seen many memories made at All-Star weekend. In his rookie season, Irving took home MVP honors in the Rising Stars Challenge. He put on a show scoring 34 points, including going 8-8 from three point range. The following season Kyrie was selected to play his first All-Star game where he scored 15 points. However, it was the night before that All-Star game that stood out for Irving. He competed in the Three-Point Shootout, scoring 23 points in the final round to win the contest. Irving’s third season featured arguably his best All-Star performance to date. He was voted by the fans to be the starting point guard for the Eastern Conference. Irving took over scoring 31 points with 14 assists, capturing the All-Star game MVP. Last season, Kyrie joined LeBron James at Madison Square Garden for his third All-Star game. He scored 11 points in a losing effort for the Eastern Conference. Irving did not make the All-Star team this season due to missing the first two months of the season with a knee injury, but I think it is safe to say that Uncle Drew will be making more All-Star memories for years to come. 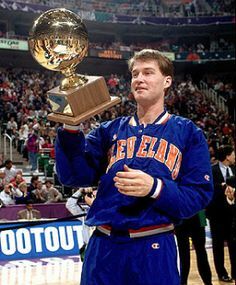 Mark Price celebrates winning the 1993 Three-Point Shootout in Salt Lake City. Cleveland’s original three-point specialist, Mark Price is the other guard on this list. Price made his first All-Star appearance in 1989, scoring 9 points off the bench. The 1992 game marked the first of three consecutive All-Star appearances for Price. In 1993, he took over scoring a record of 6 three pointers in the first half. His final All-Star appearance featured another strong performance with 20 points and 5 assists. Despite his success in the All-Star game itself, Price’s performances in the Three-Point Shootout are arguably his most memorable. In 1993, he became the first player in Cavs franchise history to win the contest dethroning reigning 3-time champion, Craig Hodges. Price followed this up with a repeat win in 1994, setting the record for most points in the final round with 24. One of basketball’s purest shooters is an easy decision for this list. The biggest no brainer on this list is Northeast Ohio’s own, LeBron James. Eight of LeBron’s twelve All-Star appearances came as a member of the Cavaliers, a franchise record. He has also been voted to the starting lineup in each of his twelve apperances. The King’s first two years in the league saw appearances in the Rookie-Sophomore Game. He shined in both games scoring 33 points and 20 points respectively. LeBron followed up his second Rookie-Sophomore Game with his first All-Star Game appearance in 2005. The following year was perhaps his best All-Star game performance to date. The 21-year-old helped the Eastern Conference overcome a 21 point deficit, scoring 29 points with 6 rebounds. The stellar performance made him the youngest MVP in All-Star game history. LeBron won his second All-Star game MVP in three years in 2008. King James led the East to a 134-128 win with 27 points, 9 assists, and 8 boards. 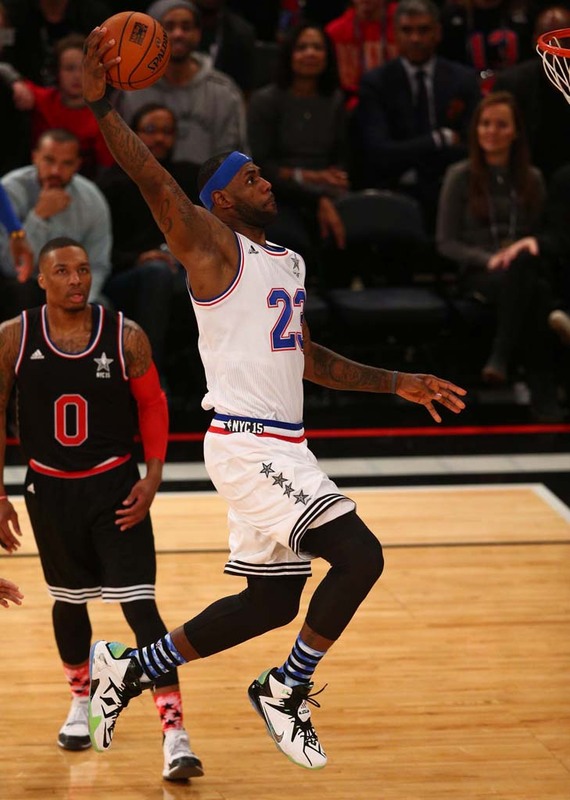 LeBron has partaken in many All-Star Weekend events including two Skills Challenge competitions failing to win either. He has many great All-Star moments, but the one thing that fans have been deprived of is seeing one of the game’s best dunkers participate in the Slam Dunk Contest. At last year’s All-Star Game he told the media that he is “over the hill now” to compete in the contest. Basketball fans around the world can only hope that the future Hall of Famer will change his mind before he ends his legendary career. 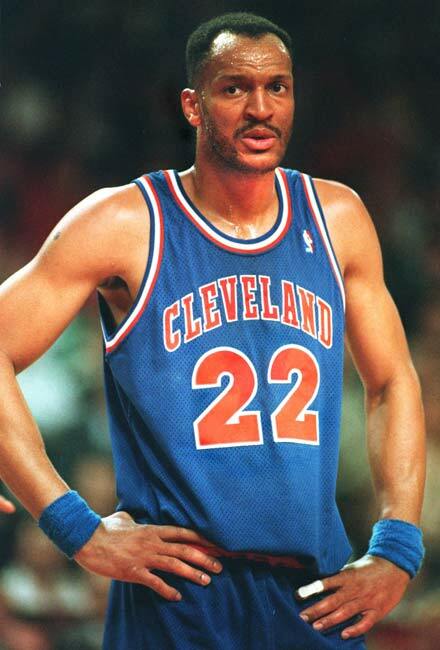 Former Cavaliers forward, Larry Nance. Larry Nance is a Cavaliers legend, but his most well known All-Star moment is when he won the first Slam Dunk Contest in 1984 as a member of the Phoenix Suns. He also made his first All-Star appearance with the Suns the following season. Nance was traded to the Cavs in 1988 and he made his first All-Star appearance with Cleveland the next year. He joined teammates Mark Price and Brad Daugherty in the 1989 game, scoring 10 points. This trio of Cavs players made a second appearance together in the 1993 All-Star Game. Nance scored 7 points off the bench in his final All-Star Appearance. This high flier is a fitting choice to be the power forward on this list. Choosing a center was the toughest decision I had to make for this list. The decision came down to Brad Daugherty and Zydrunas Ilgauskas. Daugherty made 5 All-Star appearances to Ilgauskas’ 2 appearances. In the end, I went with Big Z because even though he made less appearances than Daugherty I thought he was more impressive. 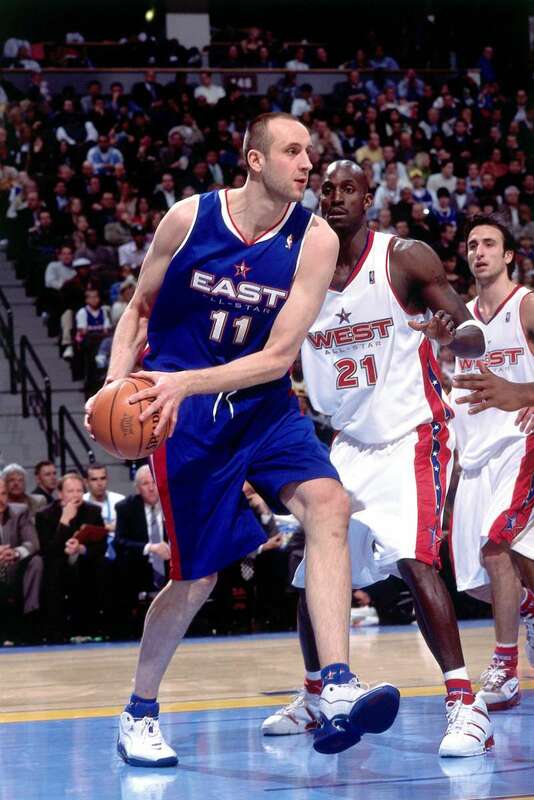 Ilgauskas’ first taste of All-Star Weekend came at the 1998 Rookie Challenge at Madison Square Garden. He was one of three Cavs players selected for the game, but it was his night. Big Z won MVP honors scoring 18 points, adding 7 rebounds and 2 blocks. It is rare that big men take over in All-Star games and Ilgauskas is the only true center to win the MVP at the Rookie-Sophomore Game. His first All-Star appearance would come in 2003, where he failed to score in 4 minutes of action. Ilgauskas’ second appearance was much better as he joined his teammate LeBron James for the game in Denver. He scored 12 points off the bench with 2 blocks. The Cavs all-time leader in total rebounds and blocked shots is a great addition to this roster. Former Cavaliers coach, Mike Brown. The Cavaliers have had three head coaches in franchise history named the head coach of the Eastern Conference All-Star team. Lenny Wilkens coached the team in 1989 in a losing effort. 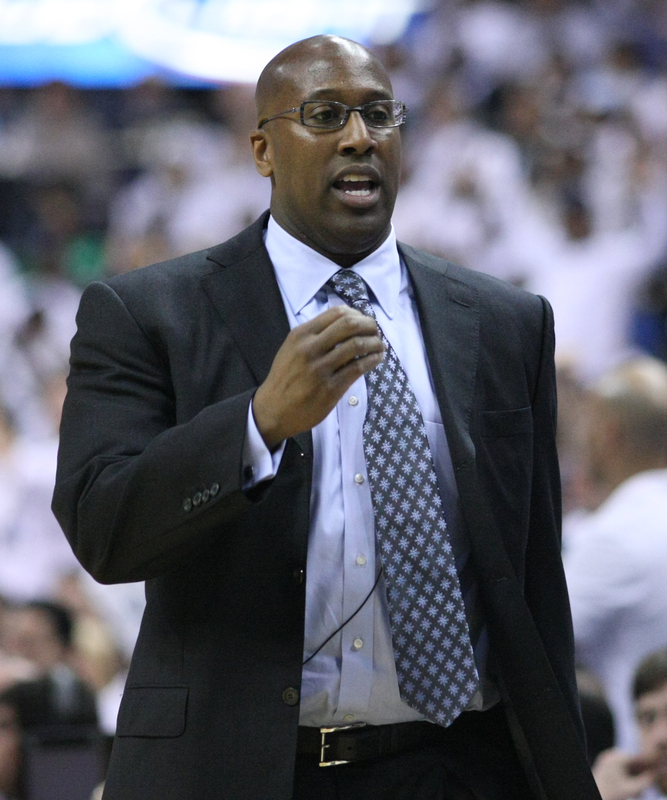 Mike Brown coached the 2009 squad that featured Cleveland’s own LeBron James and Mo Williams. Brown also returned to Cleveland with an All-Star loss. Current Cavaliers head coach, Tyronn Lue is coaching this year’s team after former coach, David Blatt was fired last month. I chose Mike Brown because 2009 was a career year for him. In addition to earning All-Star head coaching honors, he guided the Cavs to a franchise-best 66-16 record. He also coached the Cavaliers to the Eastern Conference Finals and was named Coach of the Year for the 2008-2009 season. Only time will tell if Lue can replicate the success that Brown had during his time in Cleveland, but if I had to guess I would say a NBA Championship this season would be a pretty great start.